How 3DWebWorldz , a browser-based three-dimensional place, is integrating its instructional offerings with the rest of the World Wide Web. About 85% of US adults use the web. Web-worlds use the web too, running in your browser. Most of that 85% is using social media. In a webworld, you are already in your browser. A web destination is only a click or two away. You can easily move back and forth between a webworld and another web page. Web integration is about talking advantage of the web in your neighborhood. Discord: The Discord community for 3DWebWorldz. You can read the text chat and talk in the voice channel. There are sub-channels for events, writers, educators, and artists. If you are a writer, educator, or artist, introduce yourself and tell us your interests. If you wonder about 3DWebWorldz or web-worlds in general, ask here. 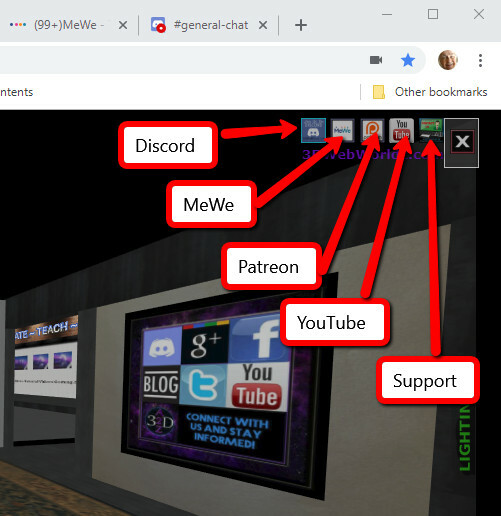 MeWe: The 3DWebWorldz community on MeWe. MeWe is a general social media product somewhat like Google+. The people of virtual worlds are turning to MeWe now that G+ is ending. The 3DWebWorldz community has articles and chats about 3DWebWorldz. Patreon: carries articles about how to use 3DWebworldz. And invites you to support the development of this educational site on the web. YouTube: The 3DWebWorldz tutorial channel. These tutorials introduce 3DWebWorldz to instructors and students. 3DWebWorldz.com User Registration is a tutorial to help students start. If you find a bug or have a technical problem, submit a ticket. The best places to ask questions are Discord and MeWe. Web-sending: Giving people a clickable web link that takes them to the page. You have a 3DWebWorldz place. You have web pages you want visitors or students to see, read, respond to. You build your library of links. You gather all those questions you have to answer for new people. You put them on the web (maybe in your class or project blog). You put objects with appropriate links in your 3DWebWorldz place. If someone asks, you point them to the object with the answers. They hover the red circle over the object and get to open the web page. Better yet, you don't have to be there. They can get the answers themselves. You can't anticipate everything people will ask. And they may ask in a place where you don't have your link objects at hand. You may have answered in your class or project blog. So you know where the answer is. You need a way to give the link immediately. Click the Chat and Radar button. Copy the url from the address bar of the browser. 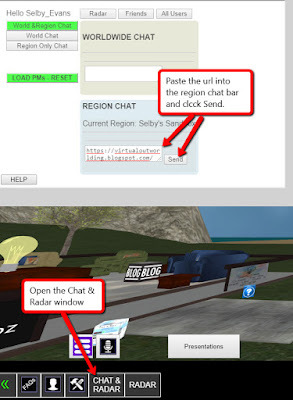 In region chat, paste the url. Expressions that start with http become web links people can click. List of encyclopedias accessible on the Internet.